Molten salts – ionic solids which become liquids at elevated temperatures – offer exceptional heat transfer, chemical stability, and thermal energy storage (TES) capability. These attributes are essential to their longstanding commercial use in a broad range of industrial settings and underlie their rising promise for CSP applications. Concentrating solar power (CSP) technologies employ mirrored reflectors to direct and focus the sun’s energy on a receiver containing a working fluid. The energy from this heat transfer fluid (HTF) is used to drive a conventional steam-electric turbine-generator plant. Relative to solar photovoltaic (PV) systems, CSP plants have a key advantage, in that solar radiation can be captured and transferred to thermal storage to support electricity generation when the sun is not shining or during early evening and night-time hours. Modern CSP plant designs commonly include multiple hours of TES capacity to better match output with load and increase the time value of solar energy production. Direct-storage plant designs use one material as both HTF, collecting solar energy within the receiver, and storage medium, providing load-matching capability. Indirect-storage designs use one material as the HTF and a second for thermal storage. Today, molten salt is commercially employed in central receiver direct-storage plants and parabolic trough indirect-storage plants. Demonstrations are under way for parabolic trough and linear Fresnel reflector systems served by direct molten salt storage. A binary mixture of sodium nitrate and potassium nitrate, commonly referred to as “solar salt,” has proven effective as a thermal storage medium in diverse CSP applications which span more than 20 trough plants deployed since 2008. For plants that incorporate TES, solar heat collected at the receiver may be provided directly to a steam generator for energy production, may be directed to storage tanks for later use, or may be split between the two options depending on operating conditions and market dynamics. Fig. 1 provides a simplified view of CSP plant operations. Fig. 1: Simplified operational schedule for CSP plants with TES. The utility load profile, solar resource availability, and plant dispatch are shown for an example day. Rather than generating at full power when the sun is available, the plant can store some energy during the day for dispatch during peak hours. During real-world operations, the optimal dispatch strategy may vary based on seasonal differences in daily solar insolation and consumer load profile, as well as other factors. Total global CSP capacity exceeds 3000 MW with more than 2000 MW under construction or in advanced stages of development, and even more in the pipeline. Roughly 50% of total operational capacity integrates an on-site TES system. 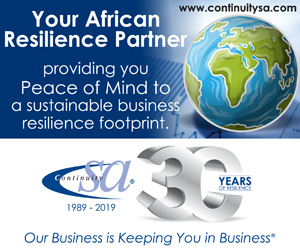 Most new plants include storage because its value outweighs the additional capital investment and the continuing operations and maintenance costs. Several TES media have been employed over time, but storage systems based on molten salt account for the majority of recent installations. Many existing CSP plants, served by molten salt storage, accounting for more than 1200 MW of capacity, consist almost entirely of parabolic trough plants with indirect TES – typically having 50 MW of generating capacity and at least 7,5 hours of storage capacity at full power. By far the most common TES technology for current CSP plants is a two-tank molten salt configuration, based on a sodium nitrate-potassium nitrate (NaNO3-KNO3) mixture commonly referred to as binary or solar salt. 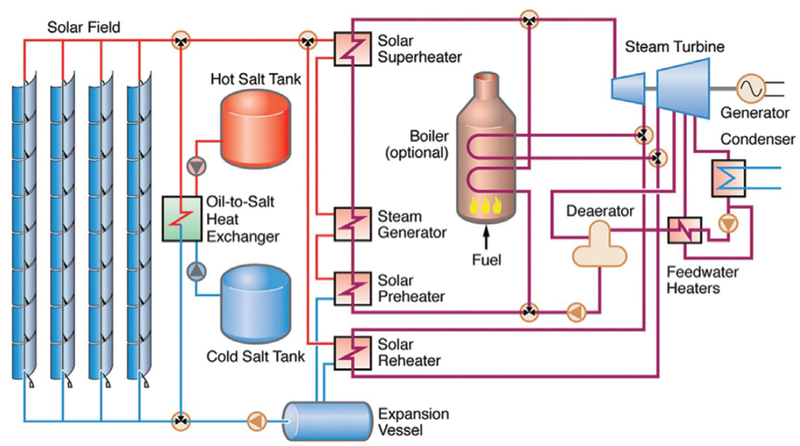 The molten salt is pumped from a “cold” tank and cycled through the solar receiver in direct designs and through a heat exchanger in indirect plants. Flow rates vary considerably depending on design and operating conditions. After heating, the molten salt is returned to a “hot” tank, where it is stored for later use to generate electricity when needed. This approach always uses the molten salt mixture in liquid rather than solid state. Avoiding salt freezing is an essential element in CSP design and operation, as this can reduce conversion efficiency, while freeze-thaw cycling within pressure-retaining systems can lead to maintenance problems. Fig. 2 is a schematic representation of an indirect parabolic trough plant with two-tank molten salt TES. Trough collectors heat a synthetic oil HTF to about 390°C. 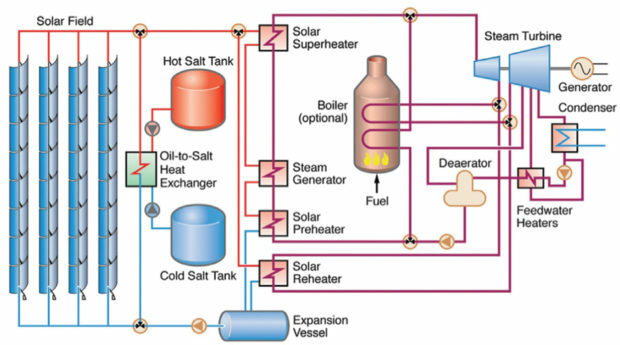 When the sun is shining, the hot HTF may be diverted to a heat exchanger for charging the molten salt TES system, and it may be used immediately to produce steam by flowing through a series of heat exchangers in the power block. In storage mode, solar salt in the cold tank, held at a temperature of about 290°C, flows through an oil-to-salt heat exchanger. The heated salt is stored in the hot tank at about 390°C until it is needed for power generation. Upon being directed back through the heat exchanger, the molten salt gives up its heat to oil passing from the receiver on its way to the power block. The cooled molten salt is returned to the cold tank, where it is maintained about 50°C above 238°C, the point at which solar salt begins to solidify (freeze). The upper temperature limit of indirect trough TES systems is about 400°C, the maximum operating temperature of the synthetic oil. For new parabolic trough plant designs, molten salt is being considered as an HTF alternative. The anticipated benefits include higher-temperature operation (~550°C) and avoided losses in the oil-to-salt heat exchanger. Further, the size of the storage system required to deliver a given amount of capacity is directly proportional to the hot-cold temperature difference, meaning that a TES system operating at 550°C can be much smaller than one operating at 390°C if both share a nominal cold return temperature of 290°C. However, thermal losses from molten salt flowing through receiver tubes distributed throughout the trough array present significant challenges. First, the large receiver area imposes a larger energy penalty at higher operating temperature, reducing field efficiency. Second, excess cooling could result in freezing. Heat tracing – cable containing electric resistance heating elements – is applied at all molten salt CSP plants for freeze protection, as solidification and thawing cycles can lead to damage within enclosed piping and other components. During normal operations, the solar salt is removed from the cold tank at about 290°C and pumped through the receiver at the top of the tower, where it is heated by solar energy reflected by the heliostat field. The salt is heated to about 565°C and returned to the hot tank. The flow rate through the receiver varies throughout the day depending on the available solar flux. During periods with high energy input, molten salt is pumped through the receiver faster to maintain a constant outlet temperature to the hot tank. When less sunlight is available, the flow rate slows considerably, giving the molten salt additional residence time to achieve the required temperature gain. To drive the power block, molten salt from the hot tank is used to produce superheated steam for a conventional Rankine-cycle turbine-generator system. From the steam generator, the salt is returned to the cold tank for storage and eventual reheating in the receiver. Overnight, molten salt in the receiver and associated piping is drained to the cold tank to avoid freezing. The capacity of trough, central receiver, and linear Fresnel plants typically is reported based on the generating capacity of the steam turbine in MW of electricity, rather than the solar field in MW of thermal energy. The size of the solar field relative to the steam turbine is defined as the solar multiple (SM). For example, a field that produces 10% more thermal energy (at its design point) than the rated steam turbine capacity has an SM of 1,1. An SM >1 means that the CSP plant can operate at its nameplate capacity for more hours of the year, including when solar conditions are not optimal. This increases the plant’s capacity factor, but at times excess thermal energy must either be dumped or stored. CSP plants with TES employ higher SMs – and larger fields – to deliver higher capacity factors. Fig. 2: Parabolic trough CSP plant with indirect molten salt TES. Adding more hours of storage increases the volume of molten salt required. On a net plant throughput basis, operating a TES system inevitably results in some thermal and pumping losses. However, relative to electrical or mechanical forms of energy storage, TES typically offers a much higher round-trip efficiency (as defined by the net electricity delivered from the storage system relative to the amount that would have been generated had thermal energy from the solar field been directly converted to electricity). Indirect trough two-tank molten salt storage systems are about 93% efficient, while direct central receiver two-tank molten salt storage systems are up to 98% efficient. TES systems offer an additional efficiency advantage, in that their annual average power block efficiency tends to be higher than for CSP plants without storage since their turbine-generator system operates at full load more frequently. The addition of TES to a CSP plant’s design can lower its levelised cost of electricity (LCOE) production, as well as deliver value to the power grid in helping to accommodate increasing amounts of variable-output wind and PV capacity. 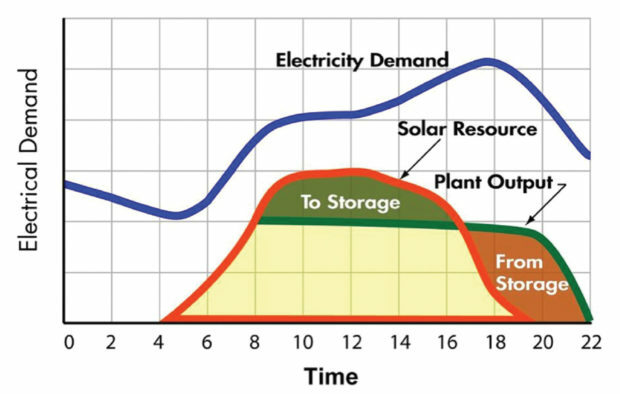 Today’s plant designs commonly incorporate TES because the incremental cost of storage is offset by LCOE reductions attributable to a higher capacity factor for the turbine-generator system, greater operating flexibility, and increased availability of solar power during peak demand periods. Determining the optimum storage size to meet power dispatch requirements is an important part of the CSP plant design process. The energy contained in the storage system can be dispatched in any number of ways, but operational strategies typically adjust the CSP plant’s output profile to take advantage of higher electricity prices during periods characterised by high demand or high time-of-use rates. In some regions, the on-peak period can extend well into the evening hours when solar facilities without storage are no longer capable of delivering energy. Two main options exist for altering energy output from the collector field to better match typical demand peaks occurring in late afternoon and evening. The first strategy involves diverting a portion of the output over the course of daily operation to charge the storage system. Stored energy is dispatched once the sun has set to extend the period over which power is supplied to the grid. Alternatively, all of the output from the collector field can be used to charge the storage system at the beginning of daily operation, delaying power generation until the system has been fully charged. The plant will then have sufficient energy in storage to continue operating through the peak and into the evening use period. This strategy simply shifts the delivery period to increase CSP plant revenues by increasing the time value of electricity supplied to the grid. For individual CSP plants, the optimal operational profile is likely to vary based on seasonal differences in daily solar insolation and in load profile, as well as on other technical and market factors. For example, alternate dispatch strategies for stored energy can optimise plant value during periods with cloudy forecasts or reduced winter-time insolation, or to better match early morning peaks, the winter customer demand profile, or energy needs during weekend operations. Alternatively, during night hours, a smaller amount of capacity may be dispatched to maintain the steam turbine at operational temperature and thereby reduce thermal cycling and heat loss at morning start-up. 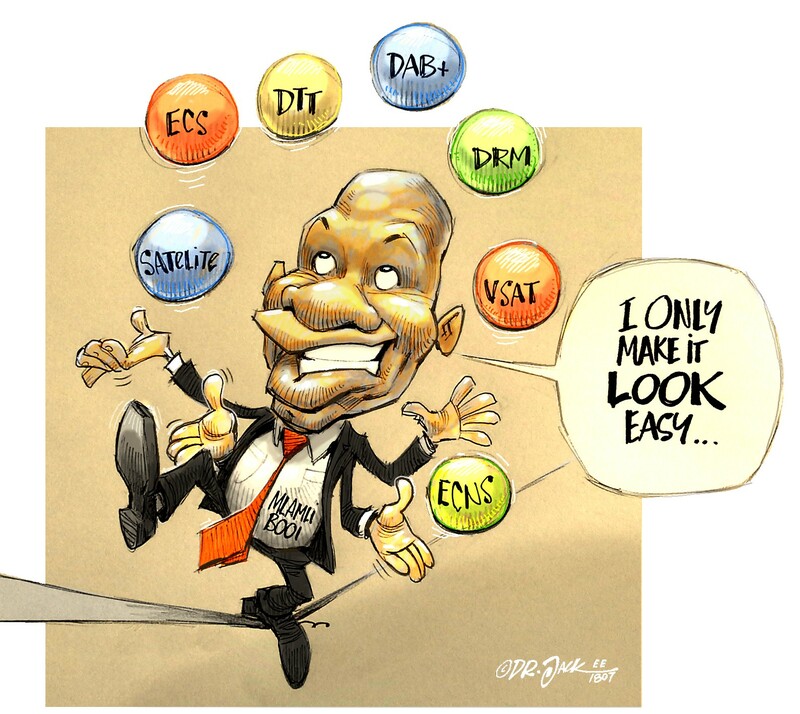 more dependable, in terms of supplying power during the highest-price periods of the year. As well as producing power on peak, these plants can mitigate the impacts created by PV and wind projects and allow higher penetration of these variable-output resources by being dispatched to afford voltage regulation and frequency control, provide ramping and spinning reserves, and reduce renewable curtailment. Under certain PV deployment and policy scenarios, CSP with TES is estimated to have an additional value of $0,05 to $0,06/kWh by being available to serve load and provide grid support services during peak pricing periods. The emergence of ancillary service markets allowing CSP plant owners to monetise these benefits is expected to further reduce LCOE. To support initial start-up after construction, CSP plants require substantial salt handling and storage infrastructure. Generally, solid salt mixtures, known as prill, are delivered in large “super sacks” containing up to 1 MT of solid crystalline feed material; salt also may be shipped and delivered as bulk, unbagged feed. Salts are hygroscopic, absorbing moisture and consolidating even when not exposed to the weather. 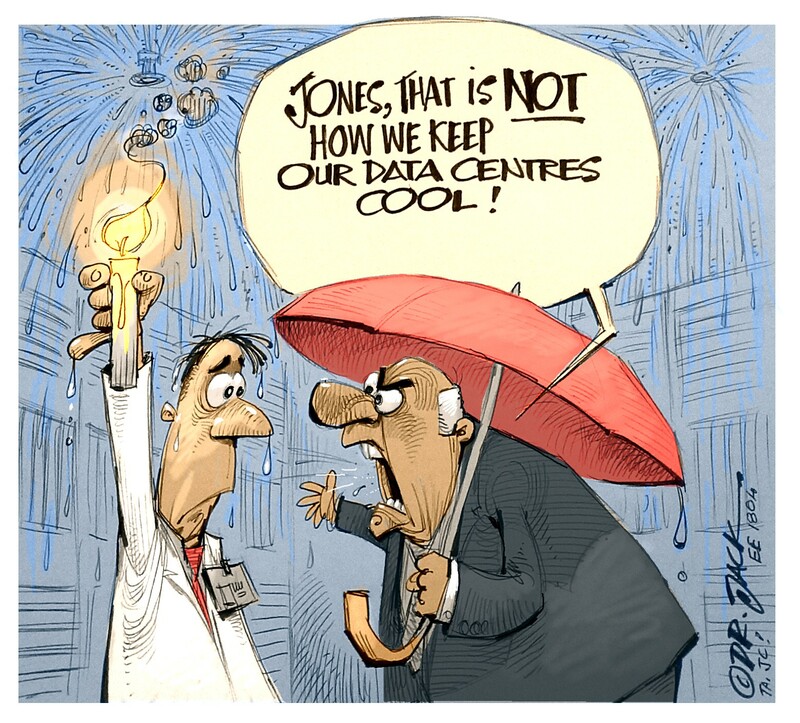 Warehouse storage or other cover can help mitigate this issue. A hammer mill or other crushing device is needed to process solid salt to sizes appropriate for melting. Fig. 3: Central receiver CSP plant with direct molten salt. CSP plants use propane-fired, gas-fired, or electric heaters to melt the salt in a settling tank. During melting a reaction involving magnesium impurities results in NOx emissions that may be reduced as required using environmental control systems. Heavy contaminants, such as sand, fall to the bottom of the settling tank. Molten salt is then loaded into the hot storage tank, which is preheated to avoid refreezing. In-tank electric resistance heaters or salt recirculation with heating may also be employed to facilitate initial plant start-up. Tank design specifications define appropriate temperature ramps and/or practices for tank preheating as the molten salt is introduced. As with any closed circuit operated at elevated temperatures, molten salt CSP systems need to be pressure-tested prior to operation. Hydro-testing should be conducted consistent with standards specifying the chloride content of the water loading, as a maximum. Much lower concentrations, as low as 2 ppm chloride, are often specified to preclude the possibility of stress corrosion cracking (SCC) of 300-series SS materials. This mode of metal failure is particular to the intermittent introduction of water in the system, either during pressure testing or for the flushing of residual salt from the conveyance system during repairs. It is distinct from the molten salt environment, which does not promote SCC. Typically, hydro-testing is conducted at ambient temperature on a section-by-section basis during commissioning. This may be followed by testing of the entire system, then preheating with heat trace before charging with molten salt. At initial start-up and after outages, close visual inspection is essential for detection of small leaks. During normal operations, conventional direct programmable logic controllers are used to monitor and manage salt temperature, flow, pressure, and other factors. Anomalous readings may provide indications of significant leaks. Leaks are normal, most commonly occurring at pipe flanges and valve stem packings. Precipitation of crystalline salt into valves over time also represents a problem by accelerating shaft wear due to scoring by hard salt particles. For nonwelded piping connections, re-torqueing of flanges may be required during commissioning and after outages to address any loosening attributable to thermal cycling. Maintaining correct temperature at the valve packing gland area is essential for preventing molten salt leakage and the potential for locking. While visual inspection during normal maintenance rounds is the most common leak detection method, at least one company has started deploying a device that monitors stem packing friction changes over time as an indicator of leakage. Targeted maintenance is effective for leak control by ensuring the correct adjustment of all valves while avoiding over-tightening of the packing. Checking valve packing for bolting tightness and leakage every six months is recommended. Packing typically must be replaced annually due to harsh operating conditions. Valve surface defects caused by corrosion can be machined up to a certain depth. Beyond that point, field modifications can be applied (special gland followers and bottom rings) to allow continued use and delay valve replacement. Heat exchanger design, in conjunction with operating procedures that limit the rates of temperature cycling to allowable values specified by the component supplier, is the most important element in managing degradation processes and avoiding leaks. Because steam pressures are normally higher than salt pressures, even in the reheater at low turbine loads, contamination of the molten salt system with steam represents the most likely outcome of a leak. In such a case, steam will carry over into the ullage space of the cold storage tank. When the tank next fills with salt, steam-enriched ullage gas will vent to the atmosphere. If the steam generator leak continues, the cycle of steam entering and then leaving the tank will repeat. The presence of steam in the cold tank will not increase corrosion rates of carbon steel, which are influenced mainly by chloride concentration in the salt. Further, steam and salt are chemically inert, to a large degree. Steam will ever-so-slightly dissociate into hydrogen and hydroxide ions. The latter can react with nitrate ions to form H2O and NO2, resulting in some NOx production but in quantity insufficient to have a measurable effect on total plant emissions. Though unlikely, a heat exchanger tube failure could have severe consequences. Contact between salt and water/steam could cause an over-pressure transient, deforming and ruining the shell if a pressure relief valve does not actuate fast enough to divert molten salt away from the heat exchanger and into a containment enclosure. It is highly unlikely that salt would ever leak into the steam or condensate systems due to the pressure differential. If salt were to leak into the reheater, it would deposit in the low-pressure turbine at that point in the expansion path where the steam temperature has fallen to 220°C. Some salt likely would precipitate on the turbine blades, and the balance would dissolve in the condensate. Alarms indicating high electric conductivity in the water treatment system would indicate the onset of molten salt ingression. Thus far, no such events have been reported, but very few direct molten salt TES systems are in operation and O&M data are held closely by plant operators. Conclusions CSP plant designs integrating TES technology provide power producers with an option for harnessing and dispatching solar energy to increase load-matching flexibility and provide grid support services. With sufficient TES capacity, these plants can operate continuously, acting as baseload sources of carbon-free power. Almost all recent or planned CSP projects include two-tank TES systems because their economic value outweighs the additional costs, and molten salt represents the storage medium of choice. At operational parabolic trough plants totaling more than 1200 MW in capacity, solar energy captured by synthetic oil HTF is available for indirect molten salt storage. Deployment of direct-storage systems – where molten salt serves as both the HTF and the TES medium – is limited to the 20 MW Gemasolar central receiver and 5 MW Archimede trough installations. However, the worldwide development pipeline includes more than 1000 MW of central receiver capacity with direct storage, and demonstrations of trough and linear Fresnel CSP systems with direct TES are planned. Solar salt, a binary 60-40 mixture (by weight) of sodium nitrate and potassium nitrate, has proven effective in CSP applications. It offers relatively low cost and a manageable freezing point, along with exceptional heat transfer, chemical stability, and energy storage characteristics at normal operating temperatures up to 565°C. Novel molten salt formulations and storage system designs are being explored in ongoing research by EPRI and others. Lower-cost storage media with wider temperature ranges could make the value proposition for CSP with TES even stronger. Based on the current state of knowledge and real-world experience, the use of sound design, materials selection, freeze protection, construction, salt procurement, commissioning, operations, maintenance, occupational health and safety, and environmental management practices is expected to result in CSP plants with molten salt storage systems capable of meeting cost, performance, reliability, and sustainability objectives.